Part of my plans for Christmas break naturally involved fishing. However, most of the break was planned for me with family time taking precedence over everything else. The one small trip I allowed myself was a one day interlude to the rest of my vacation. Even though conditions were not ideal, I still was happy to visit the Smokies. Last Thursday, I finalized plans to meet my friend Travis in the Park. 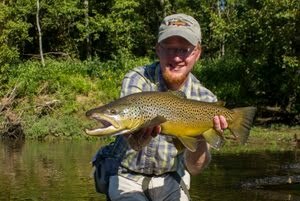 My goal was to get there early, before the sun was on the water, and throw streamers for a while. He would join me later. As it turned out, he had the best game plan. The fish really did not become active until later in the morning as the sun warmed the water just a bit. 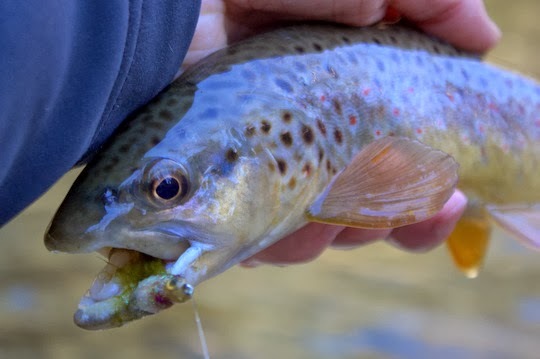 Fish will feed in very cold water so it can still be worth getting out during the cold months, contrary to popular opinion. However, the water temperature's direction is very important. 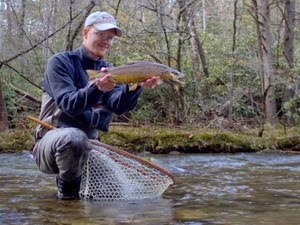 Even a small increase in water temps can get the trout moving around and active. The sun warmed the water just enough that we started to see fish up and moving around. 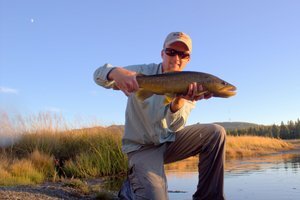 One pool in particular has a good population of trout that are normally willing to eat a well-presented fly. We all rigged up with nymphs and spread out along the stream. I worked my way up a small side channel while my friends Travis and Buzz thoroughly worked the pool. After fishing my little stretch of water, I moved back down to discover that, other than small rainbows, they had not had much catching going on. Since I had not caught anything, small rainbows sounded better than nothing. I attached a strike indicator and started working the pool. A few drifts later the indicator dove, and I found a small rainbow on the end of my line! There's nothing like getting that first fish out of the way. Able to relax since the skunk was no longer a possibility, I tossed the double nymph rig a bit longer before changing back to a streamer. 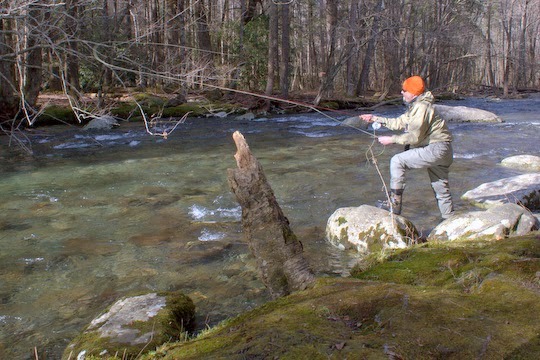 In the winter, when the streams are so cold, I prefer the faster paced method of fishing streamers as opposed to staring at an indicator while my fingers freeze. 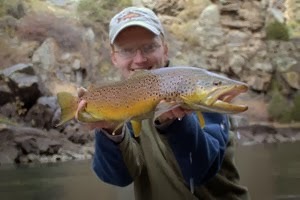 Continuing upstream, I found a pool that I know holds some nice fish but one that I've never had much luck in. This trip would end that. Just a few casts into my systematic search for trout, a flash indicated a brown in hot pursuit. The fish abruptly turned away, but I thought I might still have a chance. Two casts later the fish rose off the bottom again and hammered the streamer. The heavy tippet allowed me to keep the fight short. 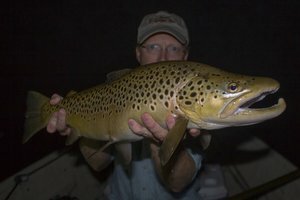 Soon I was releasing the brown back to his pool. Not a bad last trout for 2013! Later, I headed in to Townsend for lunch and to stop by and see the crew at Little River Outfitters. After chatting with Daniel for a while and looking at all the remodeling changes that have been happening, I stumbled upon the fly tying clearance bin. This has been and, after this trip, continues to be a huge drain on my finances. I mean, who can pass up a great deal? I hit the jackpot on this trip when I found a LOT of tiny hooks on sale, perfect for midge and BWO patterns. I'll be tying small flies in anticipation of the tailwater fishing this upcoming year. If you tie and stop by LRO, make sure you check out the sales bin. Your wallet might not appreciate it but think of all the money you will save with some of the super deals you can find there! I am always amazed by your photos. Congrats on your first fish of the year. I have always wanted to fish the Smokies. It is definitely on my to do list. Thanks for sharing!